Based on the webtoon titled ‘I Watch Him Every Day/나는 매일 그를 훔쳐본다‘ which was Published from 21/June/2011~17/July/2011. This is a drama about a girl, Go Dok Mi (Park Shin Hye) who is a shut-in Miss Lonelyhearts type, who spends her days spying on the man living in next building. She is caught spying by her other neighbor, Enrique Geum (Yoon Shi Yoon). Meanwhile, Oh Jin Rok (Kim Ji Hoon) is the man who notices her from long ago, and knows everything about her and will fall in love with her. Go Dok Mi is a ′city Rapunzel′ who never ventures outdoors, yet has her own set of charms that makes men go weak. Oh Jin Rok is a scruffy manhwa artist. Enrique Geum is a genius creative director, who is good-looking, stylish and bohemian and can′t get enough of soccer. He will form a love line with Go Dok Mi. Just leave me alone! Please!! No such thing as kind lies or white lies? Can I go back to being the old me? Is it to dream a new dream? 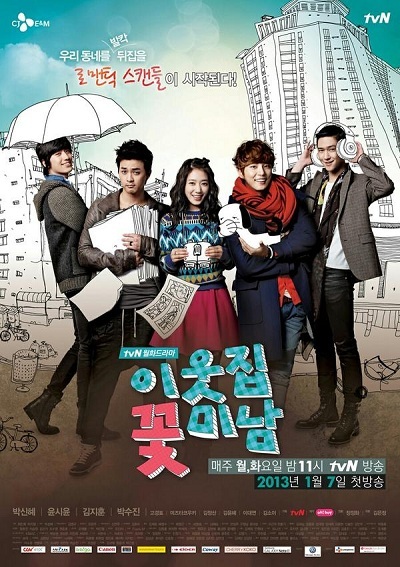 – This drama is 3rd Series of tvN Successful Flower Boy Series after Flower Boy Ramyun Shop & Shut Up Flower Boy Band. – This drama broadcast simultaneously on ‘tvN’ and ‘On Style’. This entry was posted on Friday, March 29th, 2013 at 4:42 PM	and tagged with kim ji hoon, park shin hye, park soo jin, yoon shi yoon and posted in 720p, Drama, Highly Recommended. You can follow any responses to this entry through the RSS 2.0 feed.